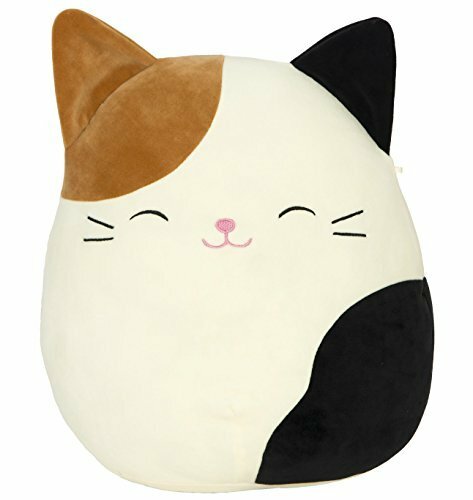 SQUISHMALLOW Cameron The Cat Pillow Stuffed Animal, Tricolor, 16"
Ready, Set, Squish. 16 inch SQUISHMALLOW Cam the Cat. Introducing Squishmallows by plush toy manufacturer Kellytoy, one of the world's most influential manufacturers and distributors of plush toys. These collectible characters are as cuddly as they are cute. Not only will Squishmallows be on everyone's squishlist, but they are perfect all year around, squishy and comforting, Squishmallows make great couch pals, pillows, bedtime buddies and travel companions. Take them anywhere on the go. The unique line is made of super soft spandex EF and polyester stuffing, similar to memory foam, for crazy, cuddly fun. Caring for Squishmallows is easy; give them lots of love, wash in warm water and tumble dry on medium heat. Recommended For Any Age. Awesome Nursery Decor. Kelly toy has created a line of loveable buddies made from super soft marshmallow-like texture and polyester. If you have any questions about this product by SQUISHMALLOW, contact us by completing and submitting the form below. If you are looking for a specif part number, please include it with your message. Alvantor Kids Tent Indoor Children Play Toy Toddler Pop up Outdoor Games Colourful Curvy Patent, Red, Orange,Purple,Green, 48" 48" 42"
Dktie Static Cling Decorative Window Film Vinyl Non Adhesive Privacy Film,Stained Glass Window Film for Bathroom Shower Door Heat Cotrol Anti UV 17.7In.by 78.7In.